Lange Eye Care Uptown Gallery in The Ocala Square. 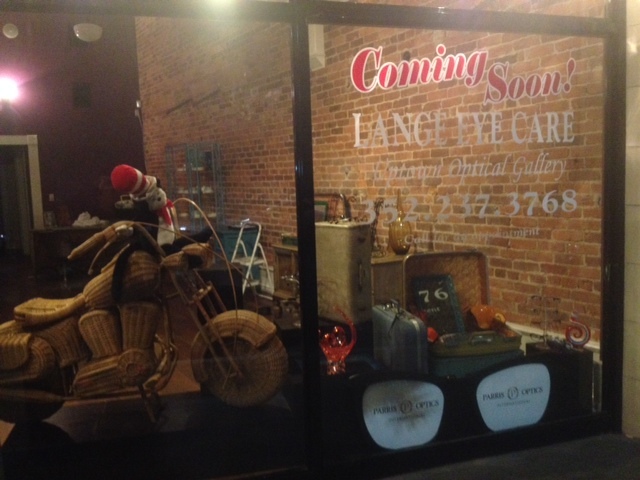 Michael Lange Optometrist and founder of Lange Eye Care and Associates is opening Lange Eye Care Uptown Optical Gallery by February 2014. This will be a super high-end optical and eye care center as well as a nutrition center. Dr. Michael Lange states there isn’t a high-end optical within 200 miles of Ocala Florida. This optical will carry frames like Channel, Tiffany, Oliver Peoples, Cartier, Prada, Fendi, Fred, Mont Blanc, Todd, Tom Ford, Lafont, Chrome Hearts, Christian Dior, Gucci , English Laundry wood collection, Parris Optics Attitude Collection and many more. This location will also have evening hours available. This office will be called the Lange Eye Care Uptown Optical Gallery. The center will also house a nutrition center that will have everything Dr Lange discusses on his radio shows. Some examples of what will be at the nutrition center are Fortifeye Vitamins, Douglas Labs Supplements, Life Extensions supplements, Biopharmas nutritional products, Organic Green teas and coffees, Manuka honeys, coconut oil, Organic Goji Berries, Organic Chia seeds, organic Cocoa snips, many different organic bars and beverages, alkaline spring water in glass bottles, All eye care related products and much more. This will be the tenth Lange Eye Care location in Florida. If you are looking for a very unique one of a kind optical frame then this will be the place to come.